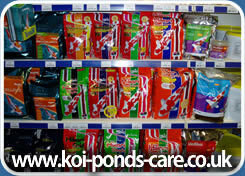 Here at Koi Ponds care we try to answer as many koi and pond related questions as possible in order for you to get the best results out of your pond and koi, therefore we have included a selection of frequently asked questions with the answers from our team who have over 20 years experience in keeping koi.We recieve many questions on a wide range of Koi related issues and in order for you to gain the answers you need we have provided a link to each section of koi keeping below. 4-ft depth is a sensible minimum, but it is better to make the pond deeper if at all possible. The greater depth provides extra gallonage in the same area, means the temperature is more stable and provides the koi with improved exercise swimming up and down (koi in shallow ponds often take on a slightly obese "rugby ball" shape). How many koi can I keep in my pond? 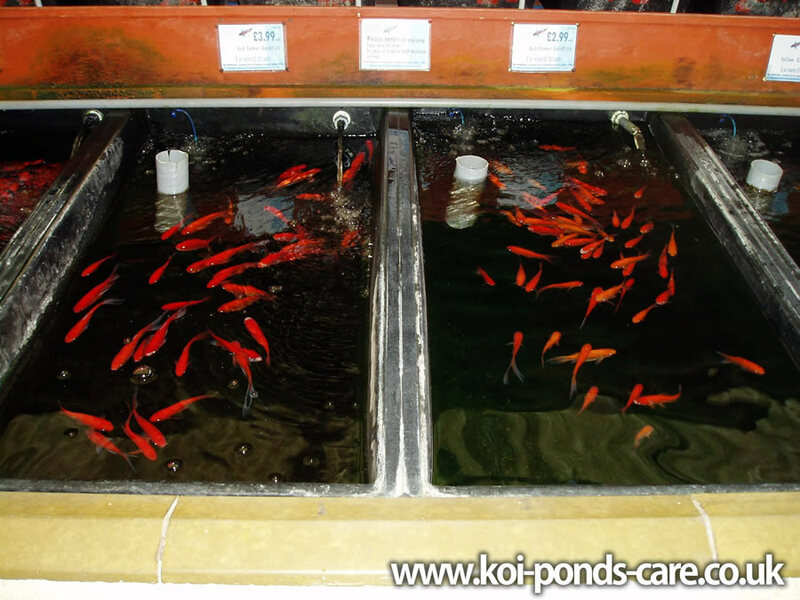 The exact stocking density will vary greatly depending on the filter size, frequency of water changes, amount of food given and size of the koi. 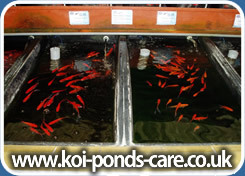 The ability and experience of the koi-keeper will also have a large influence on maintaining the right water conditions. For a beginner the general rule of thumb stocking level of 50" length of fish to 1000 gallons is a good starting point. This should enable goodwater quality to be easily maintained provided a properfilter system is fitted. Is it ok to keep Goldfish in Koi ponds? Yes, other cold-water fish such as Goldfish (Pictured Right) and Shubunkins will live happily in Koi ponds. However you should be aware that certain types of fish such as Rudd and Orfe are more sensitive to some medications. Make sure that you check any treatments before use in your pond. Do Koi ponds need a bottom drain? 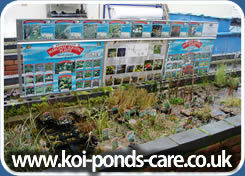 While not absolutely necessary, a bottom drain fitted to your pond will make maintenance a lot easier. Nowadays most people take the feed from a bottom drain straight into the settlement chamber of their pond filter rather than to the drainage system. The constant draw of water from the pond bottom into the filter helps to keep the pond clean and concentrates the solid waste in the first chamber of the filter or the vortex if one is fitted. A smaller pipe from the settlement chamber off to waste allows for easy water changes and removal of solids. Can I keep grow plants in my koi pond? Only if the koi will let you! Large koi generally demolish or eat most plants, a selection of which are pictured to the right. Water lilies grown in large and heavy baskets that the koi cannot tip over may be alright and marginal plants will be ok provided you have a very shallow area that the koi can't get at. Most people eventually find koi and plants don't mix in the same pond. What is the best method of construction for koi ponds? Probably the most durable method is a concrete base with block walls, all the surfaces being rendered and then coated with fibreglass. This type of construction also allows you to contour the pond so that all the corners are rounded off and the base slopes down to the bottom drain. This allows a much better water circulation and removal of physical waste from the pond. There are no folds or creases to trap dirt as with a flexible liner and of course little chance of the pond being accidentally punctured. The main drawback to this type of construction is the relatively high cost. It is essential to use a specialist firm with experience in fibre-glassing ponds to carry out this work. The wrong type of surface coat to the fibre glass can lead to poisonous chemicals leaching into the pond and causing serious health problems to the fish. 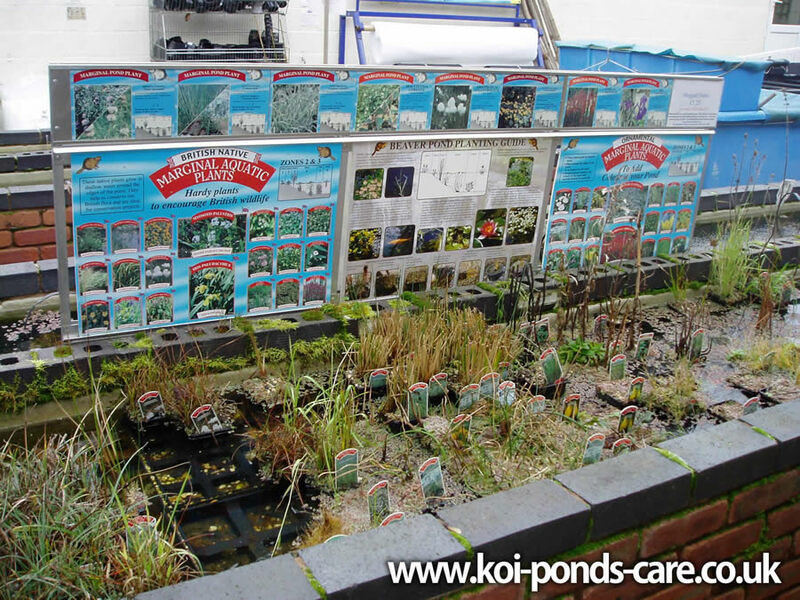 Many very successful koi ponds have also been built using flexible pond liners, which is considerably cheaper than the previous option and lends itself more easily to DIY construction. Before choosing the method to use it is best to read as much as possible on the various options. Joining your local koi club is usually beneficial as fellow members can share their experiences of using the different construction methods. Why do you recommend test kits for ponds, I can see the water is clean? Pond test kits show up levels of fish waste in the water: Ammonia, Nitrite and Nitrate, all of which are detrimental to the fish and in the case of Ammonia and Nitrite can be fatal at high levels. Because these substances are all dissolved in the water they are not visible and it is quite possible to have water that is clear and appears clean but which is extremely unhealthy for your fish. What is the best dosage rate for salt in the koi pond? ½ ounce per gallon is the standard rate to use salt for support in the treatment of ulcers, finrot and some parasite problems. This can be increased over a 3-day period to a level of 1 ounce per gallon when fish are suffering from large ulcers. The salt should be removed with a series of water changes after the treatment is finished. For accurate measurement of salt levels use a koi salt test hydrometer. Should I keep salt in my pond all year round? koi are fresh water fish and while a low level of salt may not appear to cause any problems, it is better to keep your fish In fresh water, unless using salt for a specific problem such as the treatment of ulcers. I've been advised to treat my pond once a month with anti parasite treatment as a preventative treatment, is this a good idea? No, most medications have undesirable side effects such as reduction of oxygen level or killing some of the filter bacteria. Your koi should only be subjected to these effects if there is a specific disease problem in the pond that poses more of a risk to their health. Even then it is important to ensure the water quality is correct and to identify the cause of the problem before commencing any treatment. Poor water quality kills more koi than any disease and testing the water parameters should always be the first step if your fish are unwell. What is the difference between Japanese koi Carp and Israeli or English koi Carp? Biologically there is no difference, they are all the same species and require the same conditions to live in. However the Japanese breeders have more experience in selecting which koi to grow on and also have better quality parent fish. So you should get better patterned and better coloured koi from Japanese stock, but be prepared to pay more. 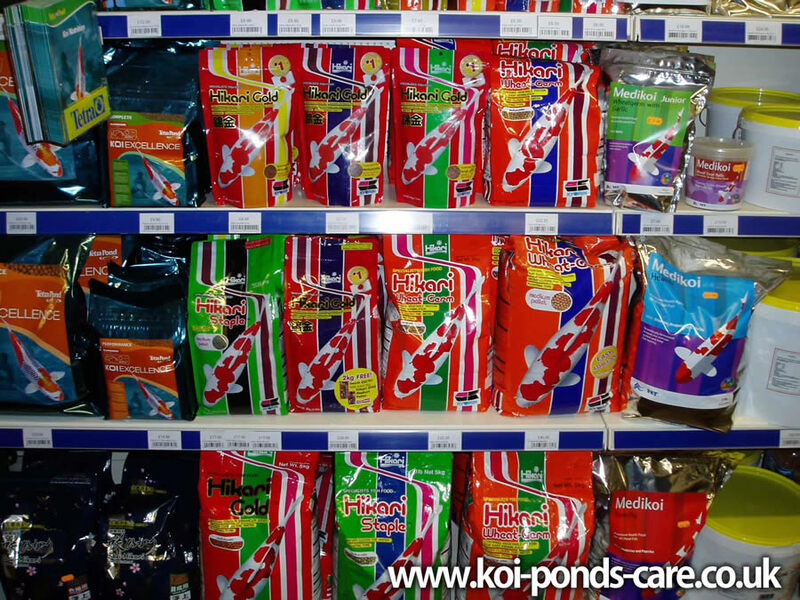 Why do I need to feed my koi different types of food, isn't there one "best" type? The ability of koi to digest and benefit from different ingredients in their food varies according to thewater temperature. In the height of summer, feeding a"growth" food should maximise their growth rate, as they are fully able to utilise the high protein in this type of food at higher temperatures. As the temperature falls at the end of summer it is best to switch to a "staple" diet. And then to mix this with wheatgerm based food during the autumn, winter and spring, when this type of food is more easily digested than high protein diets, a selection of koi feed is pictured to the right.There are also several "all season" diets such as Kusuri Multi season that have become available in the last few years. These are worth trying as an alternative to Wheatgerm, many of the newer foods also contain pro- biotics and immune system stimulators to improve the health of your Koi. Colour enhancing foods are available to improve the red colouration (Hi) and this is generally fed as about 25% of the diet during the summer months. Can I really feed my koi brown bread and lettuce leaves? Yes, Koi will eat a large variety of different foods, other favoured foods are sweet corn, brown bread and honey and even orange segments. These foods are best given as a treat and to add a little variety to the diet, large amounts of these types can cloud the water and they may not provide all the vitamins and nutrients found in a commercial koi food. How fast should the water in Koi ponds be circulating through the filter system? On ponds up to about 4000 gallons, all the water in the pond should pass through the filter in a 1 to 2 hour period for best results. In larger ponds a turnover rate of every 2 - 3 hours has been found to work quite adequately. So for a pond of 3000 gallons a pump that circulates 1500 gallons an hour through the filter would be fine. Remember to choose a pump that will move the correct amount of water per hour at the height and distance you need to pump it. Most pumps quote the maximum capacity they will circulate and this will drop dramatically if you need to lift the water up to a high waterfall for example. What is the best type of filter system, gravity fed or pump fed? Although there are many thousands of successful ponds that use a pump fed system, gravity fed filters have several advantages. In a gravity fed system the top of the filter is installed at the same level as the top of the pool, the pool is connected to the filter by 3" or 4" diameter rigid pipe work via a bottom drain. The pump is installed at the far end of the filter and returns water from the filter to the pond. Because the filter and pond are connected and at the same height, more water flows from the pool by gravity to replace that being circulated by the pump. This constant flow of water draws debris from the pool base into the filter where it is easily settled and removed. In a pump fed system any waste food or faeces from the fish are drawn through the pump, chopping them into fine sediment which is much harder to settle out in the first chamber of the filter. The pump is also at risk of clogging, whereas in gravity fed system the pump is circulating water that has travelled through the filter and is very unlikely to clog. 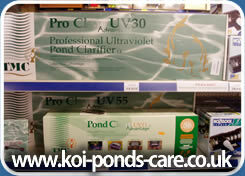 How does a Koi pond biological filter work? The fish in a pond excrete large amounts of ammonia as a by-product of their metabolism,they are in effect swimming around in their own toilet. The main function of the filter is to act as a sewagetreatment plant for your fish, it does this by providing a large surface area for bacteria to colonise. These bacteria break down the Ammonia and convert it first into Nitrite and then into Nitrate, which is relatively harmless to pond fish. The filter is in effect a living organism in its own right, hence the term biological filter. It takes five to six weeks for the necessary bacteria to become established in a new filter, during this period it is important to stock the pond gradually, adding a few fish every week. Pond filters must be operated 24 hours a day to supply the bacteria with a constant supply of oxygen and food. When the filter media needs cleaning it is important to wash it with water taken from the pond, cleaning the filter with tap water containing chlorine will kill much of the bacterial colony. I have an ultraviolet light fitted to my pool, and the water is crystal clear, why do I need a biological filter? 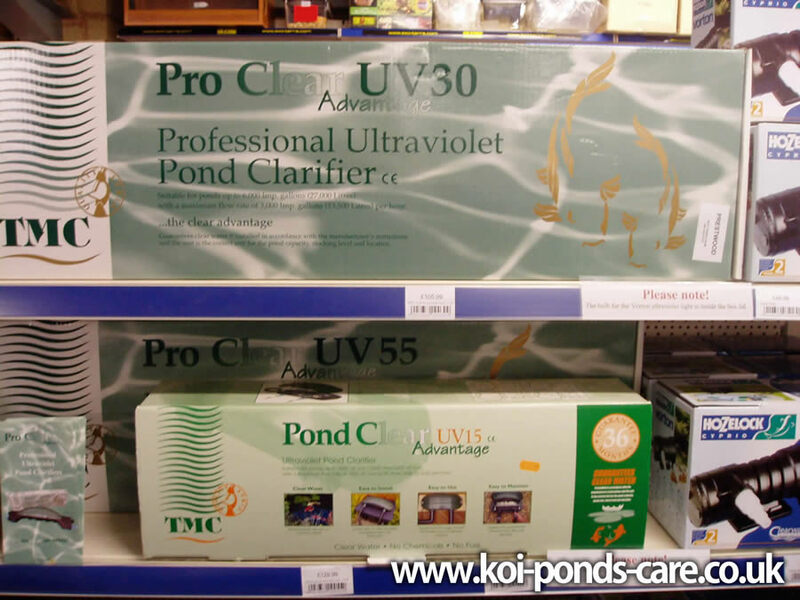 The purpose of a pond Ultraviolet light unit is to kill off green algae and provide clear water to enhance the appearance of the pond, it has no effect on improving the water quality for the fish. With a U.V fitted it is perfectly possible to have wonderfully clear water that is full of dissolved metabolic wastes such as Ammonia and Nitrite that are poisonous to the fish. An ultraviolet light (Pictured right) should be used in conjunction with a biological filter to provide water that is clean to look at, but also healthy for the fish. I have fitted an ultraviolet light to my pond and the green water has gone but I still have blanket weed, why hasn't the ultraviolet killed this as well? Ultraviolet lights only affect organisms that pass through their housing, they can clear up green water because they kill off the algae cells as they pass past the ultraviolet. Blanket weed remains anchored to the poolside and so is not exposed to the effects of the U.V unit.